As I work on planning the 2011 demo garden, I like to visualize what it’s going to look like when it’s growing (assuming all goes according to plan, and the chances of that are slim to nonexistent), and what discoveries visitors will make. Since I am organizing the garden by geographic origin of plants, I think people may be surprised by what ends up where, and also by similarities between edible plants in different parts of the world. Our ancestors often ate similar food despite living in far-flung areas of the globe and not yet trading with each other. One type of food plant that shows up in several different continents goes by the general name of beans. “Bean” is a descriptive word for a type of edible seed or seedpod. Most beans are legumes – well, let’s leave out coffee beans and any others that have acquired the name by association, and say “all beans are legumes.” That is, they belong to the family formerly known as Leguminosae, now generally called Fabaceae. Not all legumes are beans, not by a long stretch (think peanuts, alfalfa, kudzu, redbuds, cassia, baptisia, lupines, and it goes on and on). But beans are a particular type of edible legume characterized by how their seeds are “packaged” and how they’re eaten. 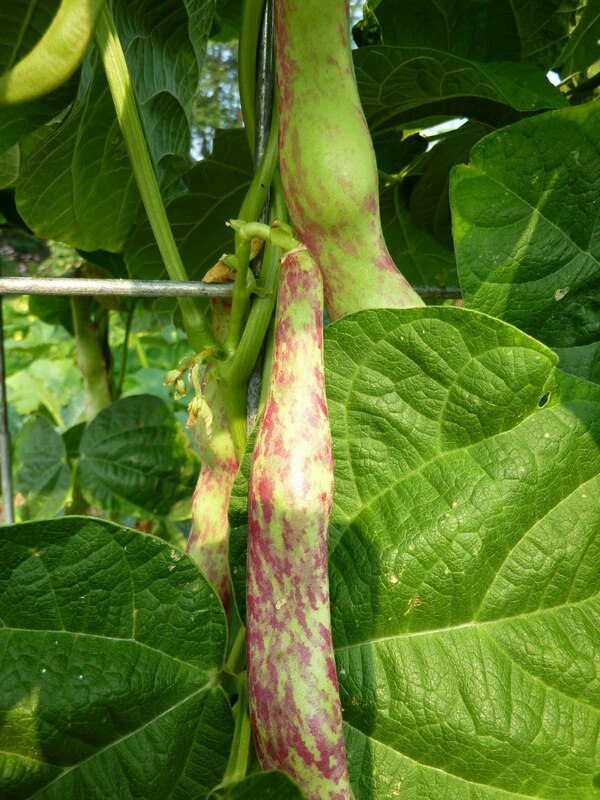 If your family is Native American, European-American, or African-American with a long history here, you probably hear “bean” and think first of Phaseolus vulgaris, which is one of the species originating in the Americas. These are our common “green beans” (or yellow, purple, mottled or striped as the case may be) or dried beans such as kidney, black, and many others. They have long-vined (pole), bush, and in-between forms. There are thousands of varieties. All the Phaseolus beans come from the Americas (despite the Latin name deriving from a term that was used to describe Old World beans). Others in the genus include the lima bean, Phaseolus lunatus, and the runner bean, Phaseolus coccineus. Then (also on the Old World side of the garden, in Asia) there are soybeans, mung beans, sword beans, moth beans, adzuki beans, hyacinth beans, and many others, not to mention lentils. I won’t have room for all of these but I’m going to try several. In the Mediterranean region we find fava beans and chickpeas, the latter growing in warm, dry conditions and the former planted as a cool-weather crop like peas. (Pisum peas, that is, the ones that are usually green. Though not always.) You will find if you visit the garden this summer that I’ve had to blur the edges of what goes in Europe, Africa and Asia, because all these plants are so ancient that the origins have been muddled by early trade, but at least the taxonomists are clearing up what fits into all those many Old World genera and which belong pretty much exclusively to the New World. Sort of. I have upstairs a Vigna caracalla (called snail bean or corkscrew vine) which I started from seed and am nursing along until it puts out its gorgeous blooms next summer (I hope). It’s a tropical plant from… South America. Where the Phaseolus live. I’m glad it’s not generally considered safe to eat, so I don’t have to put it in the vegetable garden to confuse people. What’s the first thing you think of when you hear “bean”? A particular plant, a favorite dish? (Or maybe Mr. Bean, or L.L. Bean.) What sorts of beans do you plan to grow this year?